Windows Firewall Control 5 is the latest version of the popular Windows program that gives you better firewall management options and control. The program is available as a free, somewhat limited, version, and a version that is unlocked when you make a donation. Windows Firewall Control free comes with lots of interesting features that improve Windows Firewall in one way or another. 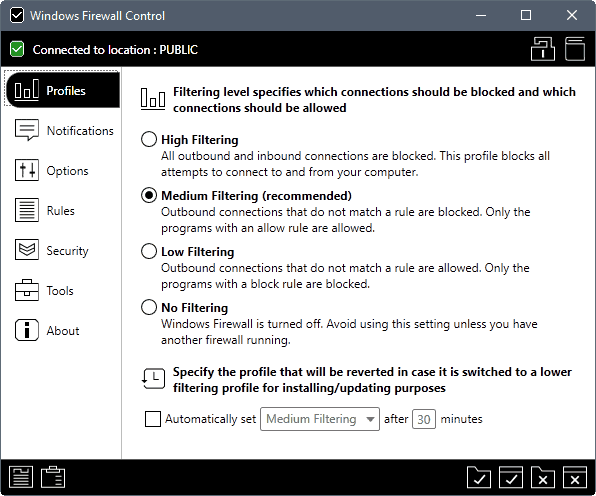 It may block other programs from adding rules to Windows Firewall, makes it easier to add new rules itself, may display invalid or duplicate firewall rules, and options to allow or block connections in the security log. The donation-ware version adds to that a notifications system that makes things a lot easier. Notifications may be displayed for outbound connections, and it is up to you to decide what to do with those. It supports two main notifications mode: display notifications whenever new connections are made, or enable the program's learning mode which allows connections for signed executable files, and displays notifications for unsigned ones. Windows Firewall Control 5.0, or more precisely 5.0.1, is the latest version of the application. The developer released two versions of the program on the same day, with version 5.0.1 of the program fixing an issue in version 5.0. Note that existing users may need to uninstall the program before they can install the new version. This depends on the version that is installed. Registered users may need to grab a new activation code on the developer website after installation to change the activation status to activated again. The new version of the program comes with an improved connection log interface. You find the two new options "auto refresh on open" and "auto receive updates" there. The first refreshes the log list automatically when you open the connections log, the second will add the most recent entries to the top of the listing automatically. Both options are not enabled by default. The two other changes are minor in comparison. The first lists the location that Windows Firewall is connected to, e.g. Public, the second added links to the about tab to make things easier there. 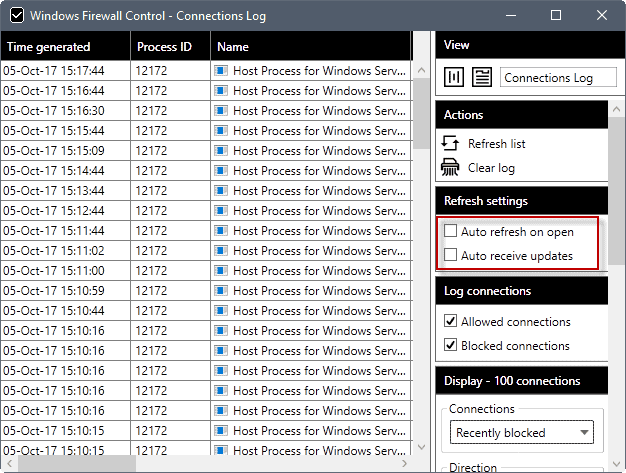 Windows Firewall Control 5.0.1 includes several fixes on top of that that resolve issues of earlier program versions. You can check out the full list of changes on the developer website. Now You: do you use a firewall program? If so which and why? I always liked SphinxSoft’s Firewall Control app better. I agree SphinxSoft’s Firewall Control is better but the price policy on this product is BS, you need to pay again for each new major version. I already contacted the developer about this (same like the NTLite dev) because this is holding so many people back from buying their products. Rubbish. Not stating the fact, the fact itself of course. I believe there must be a minimum “donation” amount to be entitled to a registered version : that’s what is commonly known as the price. Reminds me of hard lefties who nevertheless demonstrate zeal when it comes to bargaining. Why doesn’t the developer be simple and offer a paid registered version alongside the freeware? It’s not words which count but facts : my wallet will feel the same facing a price or a mandatory donation. OK, I understand. Thanks for the info/explanation, Martin. I was unaware of tax issues. The problem with donations is whether they can be construed as a gift for tax purposes. In the Netherlands where I live tax is levied at 40% of the sum gifted to an indivdual or organisation over and above the tax-free allowance which is currently €2.129,00. I’ve already reached that figure myself this year. Consequently, if I were to donate say €20,00 to someone, it’ll cost me an additional €8,00 in tax. a price is fixed sum, a donation may vary. does this make my lefty zealot? please, please! Now, Martin linked to the explanation and I understand the purpose of opting for donations. I checked out the Binisoft donation request page. He is asking for a donation of $ 10 for a life time licence. French people is a wide range, depends more on individualists, if you want my opinion. I’m not against prices which reflect costs, I was only irritated by what I understood as a shy attitude to require a price, clearly. But now I understand given the tax impllication. I had hard leftie friends in school, and I stood side by side with them when they demanded left-handed desks. ¡No pasarán! I use AVG Internet Security which includes the ability to modify the firewall. It is harder to use than Windows Firewall Control Version 5 (as you describe it) but it is effective. I just use the standard Windows firewall on Windows 8.1. If the need arises I’ll create a new rule to address whatever issue has cropped up. I use the semi-obsolete old Private FW. Works for me. It is by far THE BEST FIREWALL of all I’ve tried !!! Using Tinywall at the moment, but may give this a try since it appears to give me better control. They should send MS .Net developers to the N.Korean front. I have been using Comodo Firewall for years. I don’t get how this Binisoft firewall works. I donated money for the “pro” version and tried a simple “ping -t 8..8.8.8” so see if it blocks it until I allow it. I enabled “medium filtering” and enabled “notification balloons”. When I ping 8.8.8.8 it pings fine with a response and after 5 seconds the firewall will popup with the notification. I can then block it or keep it enabled, but in my opinion, it should block it and then ask me if I want it do contact a server. It defies the purpose of a firewall. Unless I’m doing something wrong. It’s not a firewall, it’s a firewall CONTROL program. Which means, it controls the Windows Firewall. Read the manual, and read this article you’ve commented on. It’s quite excellent, if you are willing to use the Windows Firewall. I repeat: this program is not a firewall and about your question: yes, you are doing it wrong. It’s all in the manual. Hi George. Yes, I understand that it’s a front end for the Windows built in firewall. Nonetheless, it should block traffic when set to “medium filtering” until whitelisted as the description says. Yes it is a front end for Windows Firewall, but because it requires something to run (.NET? – I forget, it’s been so long since we used it), there were compatibility issues. We think. We are not sure. There were problems with some applications. IIRC, it was Sandboxie (specific elements within, that we only discovered after some time of use) that was the last straw, that we could not overcome, after several hours, over several days of testing (perhaps could have overcome, but how much time should one spend on issues like this? ), including fresh OS installs and changed order of installs of applications. Even researching any problems is problematic as it’s name is not unique enough to sort out search results from Windows Firewall itself, and other tools with similar names. In the end, switched to Comodo Internet Security which provides the function needed, plays well with all the applications we use, AND has an integrated sandbox environment we do use (instead of Sandboxie). Much easier for our users to navigate too, to resolve issues. So, yes, a very nice front end that makes navigating Windows Firewall somewhat easier, but didn’t seem to resolve the real issue, reducing end user headaches, as it introduced other problems. Besides these problems, even if it worked perfectly, it turns out it didn’t make life easier on the end users anyway, who would need a level of sophistication that is unreasonable to demand. It seems more a tool for hobbyists with a bent for the technical depths required to use this well, and to resolve issues they may well encounter. In theory it should be blocked (the notification’s appearance does not imply it was temporarily allowed), but perhaps 8.8.8.8 is being allowed by the default, ready-made rules. Are you using it as a DNS server? Try with a standard IP address. @GM Requirements and known incompatibilities with certain types of software are already described on the website (https://www.binisoft.org/wfc.php). With most ‘security suites’ (don’t know about Comodo) you are getting yourself into another security/privacy issue which is less known, but quite common (major, too): HTTPS traffic interception. Martin, do you have any articles on this subject? It’s quite interesting and worthy of an updated investigation. I don’t think I have covered this. Will investigate but cannot promise anything right now, pretty swarmed at the moment. “BM” said that there MIGHT have been compatibility issues between an OLD version of WFC and Sandboxie. Anyone know if there are any issues between the CURRENT versions of both programs? WFC 5.0.0.1 + SBIE 5.21.4 feels okay on my machine. Thanks bjm. Where are you getting Sandboxie 5.21.4 from? Their official website currently lists 5.20 as the latest version. “BM” said that there MIGHT have been compatibility issues between an OLD version of WFC and Sandboxie.